With the Arkham Horror Third Edition Deluxe Rulebook, you’ll receive both the Learn to Play and the Rules Reference from the retail version of the game bound together into a premium hardback book. Not only will this book act as your guide as you attempt to unravel arcane mysteries and conspiracies, it also vividly explores the lore surrounding your investigations in Arkham. The book delves into the rich history of each of Arkham’s neighborhoods, providing a rich backdrop to every game. 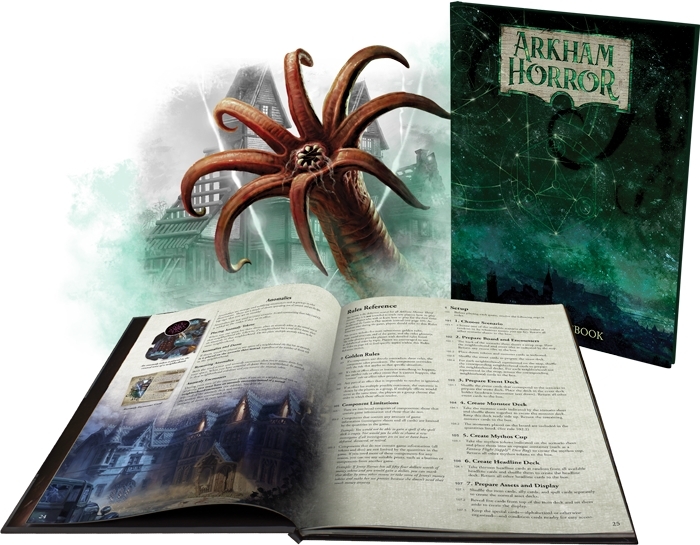 It also introduces you to two of the game's newest investigators with two full-length short stories that invite you to confront the madness of Arkham through their eyes! Finally, the Deluxe Rulebook also contains a four-page foreword written by the original Arkham Horror designer, Richard Launius, offering even greater insight into the evolution of Arkham Horror and the Arkham Horror Files series of games.